The Florida Aquarium Presents...A Wild Dolphin Bay Cruise! 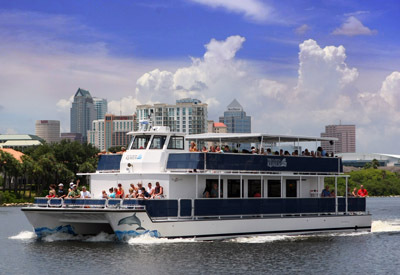 Hi Everyone, Katy here to let you know that The Florida Aquarium is chartering a Wild Dolphin Bay Cruise aboard their brand new 72-foot catamaran, the Bay Spirit ll, on September 23rd and September 24th. The cruise lasts 90 minutes with beer and wine available for purchase (cash only). The cruise will be departing at 6:00pm on Friday, September 23rd and at 6:30pm on Saturday, September 24th. Both departures will occur at the Tampa Convention Center Marina. Tickets are $22 for Adults; $20 for Seniors (ages 60+); $18 for Children (ages 3-12); and free for Children 2 & under. Ticket sales being at noon the day of the cruise at the Tampa Convention Center Marina. Cruise tickets must be purchased at least 15 minutes before cruise departure. Did you know that Tampa Bay is home to over 500 Bottlenose dolphins? They are definitely a must-see so make sure you do not miss out on this exciting adventure in Tampa Bay!